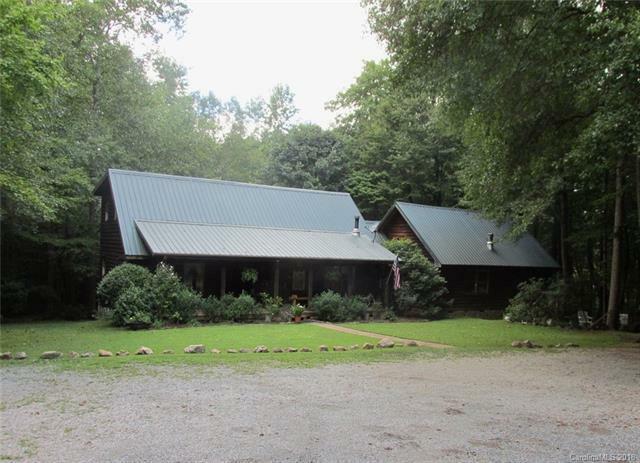 Amazing log home property just outside Waxhaw town but only 2 miles from downtown. Beautiful rustic interior and vaulted ceilings highlight comfortable living areas. Home is custom-built for strength and utility with new kitchen granite counters and new carpet in bedrooms. Two wood stoves complement heat pump system. Upstairs bedroom could be a second master suite. Bonus room temp remains consistently comfortable without HVAC ducting (has wood stove). Driveways, multiple parking areas, garage and outbuilding facilitate unlimited utility for almost any outdoor activity or need. The 5-acre parcel has myriad bushes and flower plantings, a small fish pond and meditation garden promoting the quietness of private living. The rear of the property widens with beautiful woods and a picturesque walking area, descending to a quiet stream. Pool table and appliances convey. This unique property will capture your heart. All info deemed correct as of listing but buyers should verify information.